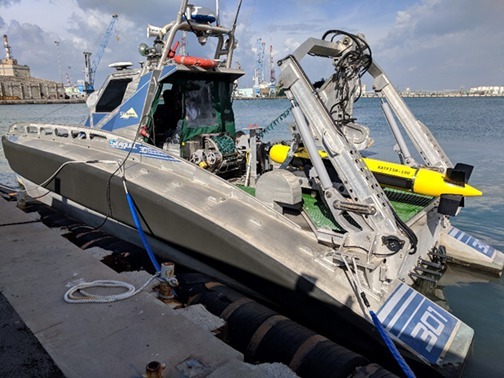 Elbit Systems' Seagull multi-mission Unmanned Surface Vessel (USV) recently completed a series of rigorous sea tests operating the Kraken Robotic Systems Inc.'s KATFISH Synthetic Aperture Sonar (SAS) towed system. These tests are an addition to a successful series of Mine Counter Measures (MCM) tests and exercises conducted by the Seagull over the past two years, including trials and exercises in participation with Western and other Navies. Actively controlled, KATFISH is an intelligent towfish platform that was specifically designed for high-speed hunting of naval mines and underwater improvised explosive devices. The system produces ultra-high definition seabed imagery and mapping for a variety of military and commercial applications and is capable of transmitting the sonar data in real time. Integrated onboard the Seagull, it provides a high-performance sensor contributing to an end-to-end, unmanned, mine hunting capability. Kraken Robotics Inc. is a marine technology company that is dedicated to the production and sale of software-centric sensors and underwater robotic systems. The company is headquartered in St. John's, Newfoundland with offices in Dartmouth, Nova Scotia; Toronto, Ontario; Bremen, Germany; and Fairfax, Virginia.